Ron Struthers, who believes the ideal marijuana stock to buy at this time is one that is focused on cannabis oil, profiles one such company that he sees as undervalued. I have been commenting that a market correction was likely in October and the marijuana licensed producers (LPs) were overvalued. This is why I had no new stock picks in October and only one in September. Patience is a tough discipline for investors but it most often pays off. I will now start adding some new picks to our list. Now is the time to buy as the Marijuana Index just bounced off the lowest point of the year (close enough) and has started a new rally. Major stock indexes have bounced off support and are in rallies as well. The LPs witnessed a very dramatic increase in stock prices and were priced to perfection. It was no surprise that they took the brunt of the correction. However, I believe after legalization, the big growth will be in cannabis oil and edibles. We can see this clearly in a new study on the Colorado cannabis market. In Colorado, demand for flower marijuana products as a portion of overall sales has declined each year since the market opened in 2014. In 2017 flower was 61.2% for medical market and 54.1% for adult use. A growing share of regulated marijuana sales are in marijuana flower alternatives, such as concentrates or edibles. In 2017, for example, more than one third (37.7%) of total sales were non-flower products, compared to 25.4 percent in 2015. The most popular alternatives are oil-filled vaporizer cartridges, wax/shatter concentrates and infused edibles. Compared to the overall increase in marijuana sales of 51.6% from 2015 to 2017 ($996 million to $1.5 billion), concentrated product sales increased by 114% and infused edible sales increased by 67% over the same period. I am certain we will see the same trend in Canada and the reason is quite simple. New users that come into the market because it is now legal are not going to take up smoking. They are most likely to go with oil and edibles. The oil is required for edibles and another big hit in Canada will be drinks. Canadians are big beer and wine consumers so cannabis infused drinks will likely go over big time. They are not legal yet, but the Liberal government says that will come in 2019, which is not far away. Shares Outstanding 93.1 million approx. Fully diluted 109.3 million approx. One of a handful with all licenses, Dealer license, Health Canada ACMPR Cultivation and Processing License. ISO 17025 Lab accreditedFirst in Canada for cannabis. Supply and sales agreement with Canopy Growth (CGC). Best in class extraction process to produce cannabis oils. Canadian distribution rights for “Happy Apple” Washington State’s #1 selling cannabis infused beverage and others. Recently closed $27.3 million bought-deal financing at $1.95 per share. Valen’s main focus is on extraction of cannabis oil. It does not require big grow facilities and will benefit from the much higher margins on cannabis oil. Its proprietary extraction process is boasted as the best and most efficient on the market. Investors are able to attest to this with the ISO 17025 certification, the Thermo Fisher award and a supply deal with Canopy Growth. While demand for cannabis flower is strong, it is even more so in an under-supplied cannabis oil market. Valens is ramping up its production to process 156,000 kg of flower per year based on doubling of current capacity of 78,000 kg. While there has been much hype in the market about the Constellation deal for beverages and speculation about Coca-Cola, Valens is already positioned as well or better than anyone for the upcoming beverage market in 2019. Its multiyear deal with Tarukino Holdings gives Valens access to Tarukino’s proprietary emulsion technology that transforms cannabis into water-soluble form for beverages while masking any cannabis taste. 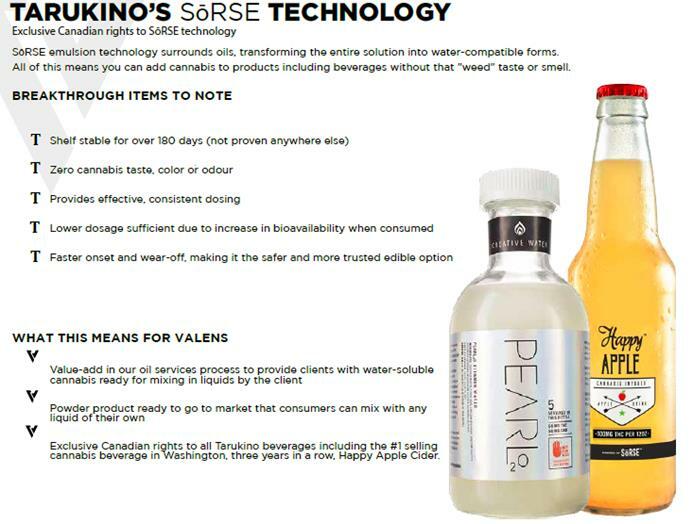 Valens also has the distribution rights in Canada for the popular “Happy Apple” drink and Pearl20 that can be used to mix drinks and edibles, as well as others. Mr. Tyler Robson, CEO & Director. Based on Mr. Robson’s impressive commitment and contributions to Valens Groworks, he was appointed CEO in May 2017 after previously serving as Chief Operating Officer. He attended the University of Saskatchewan on a football scholarship, graduating with a Bachelor of Science degree. He returned to Kelowna to pursue his passion for the cannabis industry by focusing on research and development, plant innovation and life sciences. Mr. Chris Buysen, CFO & Director. Mr. Buysen has over 15 years of diverse financial experience working as a senior financial executive with many public and private organizations in a wide range of industries including retail, pharmacy and consumer packaged goods. Ms. Chantel Popoff, Vice President. In 2007, Ms. Popoff was appointed Director of Operations, then Director of Marketing for a fast-growing Western Canadian retail pharmacy chain. The pharmacy chain’s success led to an acquisition in 2012 by Shoppers Drug Mart. In January 2013, Ms. Popoff took the opportunity to join a Canadian natural health food company, leading the operations and marketing of a national product launch. By late 2015, Ms. Popoff and her team had gained shelf placement in over 8,000 stores, while implementing standard operating procedures, financial reporting structure and national consumer and trade marketing programs to grow the brand. She was promoted to president of the company in 2016. Ms. Visintainer, Head of Quality Assurance & Quality Control. Ms. Visintainer has a B.Sc in Microbiology and M.Sc., in Biochemistry. After graduation, she worked in a QA/QC laboratory where she gained experience with quality management systems, such as, GMP, GLP, and ISO. Furthering her industry experience, she worked as a research scientist for a company involved in the testing natural health products. She was involved in the R&D of new testing procedures and setting up an ISO 17025 accredited laboratory. She has been applying this experience in cannabis setting up labs to ISO 17025 standards. Mr. Shiskin, Head of Production. Mr. Shiskin’s career started as a multi-ticketed Red Seal tradesman, where he worked in a variety of industries. In 2015 he had the foresight to enter the rapid growing cannabis industry where he took extraction training in multiple facilities around North America. Upon gaining an in depth understanding of the specific process of extraction he began designing and fabricating a variety of high throughput extraction systems. With this ever growing knowledge of plant science and the extraction processes he is now the extraction process manager at Valens Agritech. Mr. Smith, Special Projects. Mr. Smith has been involved in analytical testing for over 15 years. He has developed quality management systems that have led to ISO accreditation for laboratories specializing in the analysis of natural health products. Mr. Smith has taught technical courses on analytical instrumentation to technical support staff and specialized training for users with demanding analytical applications. Mr. Carroll, Business Development & Operations. Mr. Carroll graduated from the University of Calgary with a bachelor’s in Psychology and a minor in Law and Society. His academic career then brought him to Kelowna, BC where he earned a master’s degree in psychology from the University of British Columbia. Chris had the unique opportunity to specialize in cannabis under the supervision of Dr. Zachary Walsh, and through his degree has acquired a comprehensive level of knowledge regarding medical cannabis. Chris also has several years’ worth of experience working and volunteering in the cannabis field. Ms. Mann, Head of Marketing, Business Development, Associate to CFO. Ms. Mann (CA) completed her Business Management degree at the University of British Columbia. She has diverse experience at both big four and mid-sized firms and experience building multiple brands. Mr. Sailer, New Product Development & R&D, has a B. Sc from the University of British Columbia, focusing on plant-based sciences. For the last several years Desmond has been advancing his skills in plant extractions while working as an extraction consultant. Valens operates three subsidiaries, Valens Agritech Ltd., Valens Farms Ltd. and Valens Labs Ltd. Let us look at some detail in all three. This is Valens extraction business that uses a proprietary distilling process for full-spectrum oils and extracts. It produces an exceptionally pure product that are free from additives and adjuncts. To understand this business, it is crucial to understand extraction yields. Extraction yield is the ratio of input plant material needed to produce one gram of concentrated product. For example, it is commonly understood that about 7 grams of trim is needed to produce one gram of butane hash oil (BHO). However, these yields are different depending on the solvent used in extraction. Yields are always changing as production and refinement technology evolve. During the production process for concentrates and infused products, some amount of plant material and THC dissipates. For example, THC is commonly infused into cookies, brownies and other baked goods by first constructing cannabis-infused butter, where THC is extracted from plant material and is then reconstituted into THC-infused butter. This butter is combined with other confectionery inputs to provide a final edible product. However, some of the THC in the plant material dissipates in the process. 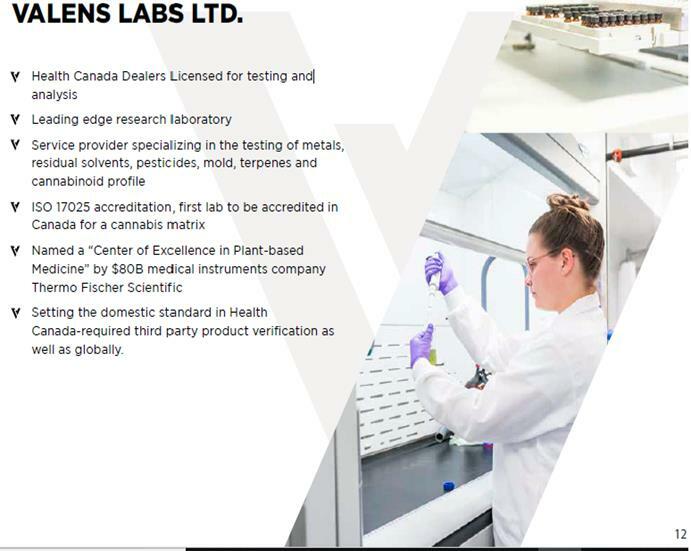 On October 15, Valens received its LP License for the 25,000 square foot agritech facility in Kelowna, BC, built specifically for extraction. The most popular method for solvent extraction in Canada is the use of supercritical or subcritical CO2. The equipment used is standardized but the specific inputs (i.e., temperature and pressure) are not. This turns the whole process into somewhat of an art that Valens has perfected to produce the highest quality oils and resins. The company’s proprietary process for extraction is what sets it apart from competitors. Valens has been able to improve its efficiency so that the least possible amount of material is wasted during processing. A higher efficiency in this process allows for greater revenue return per gram of raw cannabis extracted. The company has installed a number of CO₂ and ethanol extraction systems that have been customized to ensure that the end product does not lose valuable compounds otherwise lost in the refining process. These systems are currently capable of processing more than 72,000 kg of cannabis per year. Valen’s extraction process is among the most efficient in the business and probably why Canopy Growth chose to work with them. I expect many LPs to follow in Canopy’s footsteps. This is a joint venture with Kosha Projects and will allow Valens to grow its own strains and control from seed to final product. This will be used to brand its own retail products. The phase 1 build out is in stages of 40,000 to 100,000 and finally to 400,000 sq ft. First crop is expected to be planted in Q3 of 2019. This is a great deal for Valens because of a zero cash outlay with Kosha contributing 100% of land, building and equipment costs. All hard assets will be split 50/50 between Kosha and Valens, thereby providing $37.5 million of net assets to Valens’ balance sheet with no cash outlay or liability incurred. Valens and Kosha to split profits on a 50/50 basis following cost recovery by Kosha. 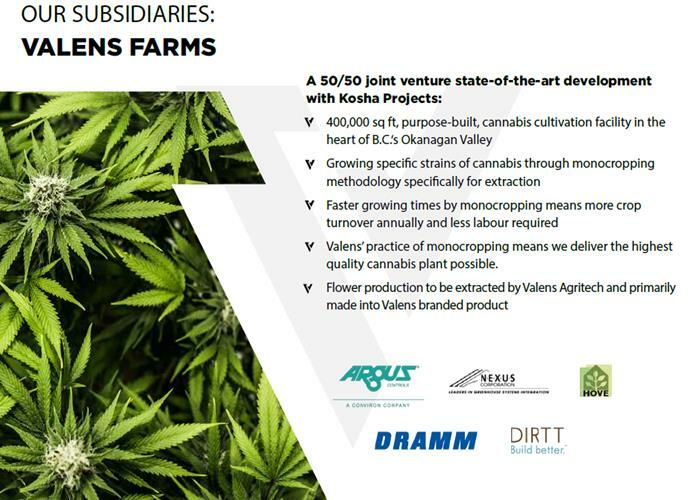 Valens Farms is expecting phase 1 production of up to 56,000 kg per year (once fully developed to 400,000 sq ft) of premium monocrop cannabis, primarily for extraction purposes. Mono cropping minimizes grow time, allows greater crop turnover, and is expected to enhance profit margins. On Oct. 29, Valens signed a share purchase agreement with Australia-based RotoGro International Ltd. to sell one of the company’s wholly owned subsidiaries, Supra THC Services Inc., which currently holds the company’s second dealers license, for total consideration of $11 million. Concurrently with the transaction, the company will transfer all of the existing assets of Supra, except the license, into a new subsidiary, Valens Labs Ltd., and sell the remaining entity to RotoGro. Valens Labs will provide the new platform for the company’s lab service business and ensure a seamless transition following the sale of Supra. The purchase price will be paid at four milestones and will comprise $2 million in cash and 18.9 million shares of RotoGro with a current estimated value of $9 million. This gives a very good indication that a dealer’s license is worth over $10 million. Most cannabis infused beverage products are not water soluble and take 30 minutes to 2 hours to onset and last for 4 to 8 hours before wearing off. With Tarukino Valens can now have edibles and beverage that have a 515 minute onset and wear off after 12 hours, just like an alcoholic beverage. Valens can now be the best in class on extraction and product capabilities. With Tarukino, Valens now has a technology that can revolutionize cannabis infused beverages creating a true competitor for alcohol. Valens has analyzed countless numbers of water solubility, accelerant and deccelerant IP but none as sophisticated as Tarukino. Valens believe it gives it an advantage on all its competitors. You can learn more about these infused products with these two videos.Tarukino currently sells the #1 and #2 cannabis infused beverage in the U.S.
Valens is looking to expand into the international markets and on August 29, Valens signed a letter of intent with Colombian licensed producer Eticann S.A.S Zomac. Under the terms of the agreement, the company will purchase cannabis materials from Eticann for use in its proprietary extraction system. In addition, Valens will have exclusive rights to provide extraction services for Eticann’s oil product offerings, will provide related expertise to Eticann for toll processing services in Colombia and surrounding markets, and will be granted the option to purchase up to 50% of Eticann’s issued and outstanding shares. Colombia is well known for its marijuana and brands derived there could command higher prices. Last financials show $2.8 million in cash and no long-term debt. Since then, Valens completed a $27.3 million bought-deal financing at $1.95 per share with one-half warrant. Each full warrant is exercisable at $2.54 for a period of 24 months. As I pointed out above, Valens will have no cash outlay for the 400,000 sq ft Kosha grow facility. The most recent video with CEO Tyler Robson on the beverage acquisition is well worth watching. We don’t have to be concerned with Valens having to compete in an ever crowding flower producer market. The market for cannabis oil is in shorter supply and I have no doubt will show stronger growth than flower, post legalization. This is probably a chief reason Canopy Growth did a deal with Valens. Valen’s business strategy is focused on producing and selling high-margin products and services from carefully extracted cannabis oil. The company will have three key revenue streams: oil, resin and white label products. I expect the majority of the company’s revenue over the near term will be derived through cannabis extraction tolling agreements with existing ACMPR licensed producers, like the deal with Canopy. More will follow. The margins to sell cannabis oil are much higher than selling the flower/plant to smoke. A gram of cannabis to smoke will sell between $6 and $10, depending on location and strain. LPs are claiming costs of around $1.75 to $3.00 per gram so gross margins are perhaps best at 200%. However there is a very large investment outlay for grow facilities. Now if we take that same $2 cost per gram and use 7 of them for 1 gram/ml oil equivalent, the cost is around $14. It is important to keep in mind that lower priced cannabis is often used for oil extraction, such as plant trim. The THC oils that you can vaporize cost around $40 to $60 per gram, so about 300% gross profit and that is using a high cost input. That is sort of the old school numbers. The industry now is using modern supercritical or subcritical CO2. According to Deloitte, CO2 extraction should cost approximately $2,525 per 100 kg of plant material, versus approximately $2,626 per 100 kg for solvent extraction. This means a cost of $2.52 per gram (ml) so is not much to add on to the cost of the raw cannabis. Oil is selling for approximately $50 per ml retail. Therefore the margins are much higher. Another obvious way you can verify the higher margins is looking at any of the LP recent financials that are selling oils. They are all claiming increased dollar values per gram sold and attributing this increase because of higher ratios of oil and concentrate sales. Another important advantage of cannabis oil is the way longer shelf life. You can keep flower on the shelf for three to five months while oils and resin are good for three or four years. Many LPs will end up converting flower to oil, if only for longer shelf life, which is not an issue now, but down the road. Also consider excess flower will get converted to oil and companies like Valens will be able to buy this flower at discounted prices. Legalization in Canada will go down the same path as states that legalized in America. The growth in oil will be much stronger than flower. We already see this with Health Canada as sales of cannabis oils in the most recent quarter (March 31, 2018) were 10,326 kg, up 11% quarter-over-quarter and up 82% year-over-year. The most recent quarter to June 30th saw another increase to 12,264 kg. Many market participants believe, with the new development of controlled-dose capsules made from extracted oil, that demand for concentrates and derivative products will overtake flower sales by 2020. The Tarukino deal will be particularly important when beverages come online in 2019 and will provide another high margin revenue stream for Valens. I believe in time that a company focused on oil and extracts will be priced at higher multiples than LPs. At current prices, Valens has an undervalued market cap of $130 million and subtract cash about $100 million. Valens is currently capable of processing 78,000 kg of raw cannabis per year. That is over 10 times Aphria’s current production rate. Based on the last quarter Aphria is selling cannabis a rate of 7,200 kg per year and less cash ($273 million) has a market value of $3.5 billion. We can also compare with two other cannabis stocks suggested in this newsletter that have done very well for us and are at a similar stage of early production and start up, Emerald Health and Green Dutchman. Emerald Health (EMH) will sell flower, oil and some of its own products. Currently it has little revenues and is ramping up production. Emerald has an agreement to supply B.C. Liquor board 13.000 kg/1.5 years and has supply agreements in Ontario and NFLD. The current market value is $498 million with $72 million cash subtracted. The Green Organic Dutchman (TGOD) has no revenue and its first production is slated for the first half of 2019 from its Lancaster, Ontario, facility. That facility is capable of 14,000 kg/year and the company has big growth plans and if all is completed will give it 170,000 kg per year in the long term. The current market value is $594 million with $330 million cash subtracted. You can get more tedious, use more examples but any way you slice it, Valens is undervalued with stronger potential than most. Not only do the fundamentals scream buy, but so does the chart. It has come all the way down to support and has bounced off that level. What also is important, it has totally filled the gap from the pop at $1.40 to $3.00. Worse case is next support at the $1.05 lows but I doubt that with the market now in a rally. 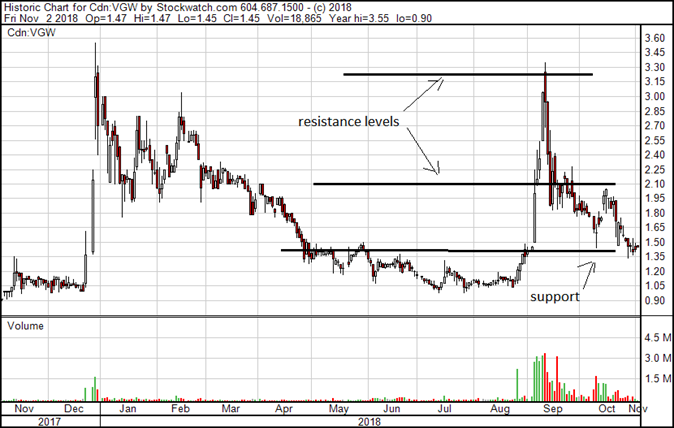 First resistance is $2.10 area than $3.20 highs. I currently own 11,300 shares. For further info, contact Scott Young, Business Development & Investor Relations. Mr. Young’s focus at Valens is corporate finance initiatives and has spent the past 15 years working in the capital market sectors of Canada, the United States and Europe. He also has extensive business development experience in Hong Kong, North and South America. Scott Young 705-888-2756. Ron Struthers founded Struthers’ Resource Stock Report 23 years ago. The report covers senior and junior companies with ample trading liquidity. He started his Millennium Index of dividend stocks in 2003 – $1,000 invested then was worth over $4,000 end of 2014 and the index returned 26.8% in 2016. He retired from IBM after 30 years in customer service, systems and business analyst, also developing his own charting software. He has expertise in junior start-ups and was a co-founder of Paramount Gold and Silver. 1) Ron Struthers: I, or members of my immediate household or family, own shares of the following companies mentioned in this article: Valens Groworks, Kinross. I personally am, or members of my immediate household or family are, paid by the following companies mentioned in this article: None. My company currently has a financial relationship with the following companies mentioned in this article: Valens Groworks is a paid advertiser at playstocks.net. I determined which companies would be included in this article based on my research and understanding of the sector. All forecasts and recommendations are based on opinion. Markets change direction with consensus beliefs, which may change at any time and without notice. The author/publisher of this publication has taken every precaution to provide the most accurate information possible. The information & data were obtained from sources believed to be reliable, but because the information & data source are beyond the author’s control, no representation or guarantee is made that it is complete or accurate. The reader accepts information on the condition that errors or omissions shall not be made the basis for any claim, demand or cause for action. Because of the ever-changing nature of information & statistics the author/publisher strongly encourages the reader to communicate directly with the company and/or with their personal investment adviser to obtain up to date information. Past results are not necessarily indicative of future results. Any statements non-factual in nature constitute only current opinions, which are subject to change. The author/publisher may or may not have a position in the securities and/or options relating thereto, & may make purchases and/or sales of these securities relating thereto from time to time in the open market or otherwise. Neither the information, nor opinions expressed, shall be construed as a solicitation to buy or sell any stock, futures or options contract mentioned herein. The author/publisher of this letter is not a qualified financial adviser & is not acting as such in this publication.